Tiger Lily Press is pleased to announce that its 2017 Working Artist Program residency has been awarded to Brad Thiele of Cincinnati, Ohio. 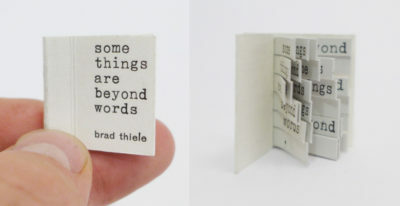 Thiele is a conceptual artist focusing on wordplay through drawing, collage, altered books and letterpress works. He received his MFA from California State University, Chico, including a year studying at die Akademie für Bildende Künste in Mainz, Germany. 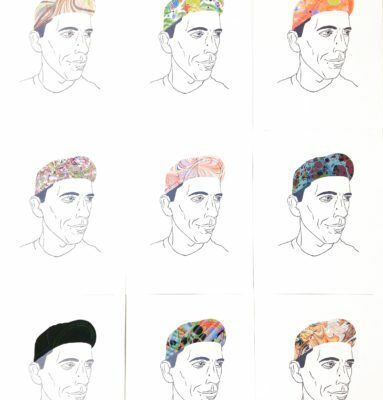 He has exhibited across the United States and in Germany, and was a 2015 Artist-in-Residence at the Center for Book Arts, NY, NY. 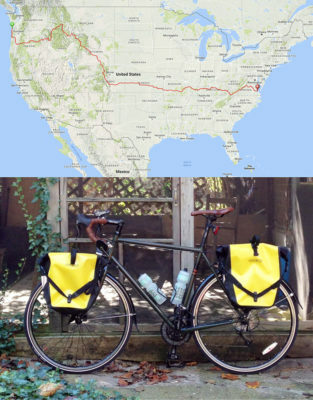 Thiele will develop his residency around his upcoming solo bike tour from Virginia to Oregon on the TransAmerica Trail. 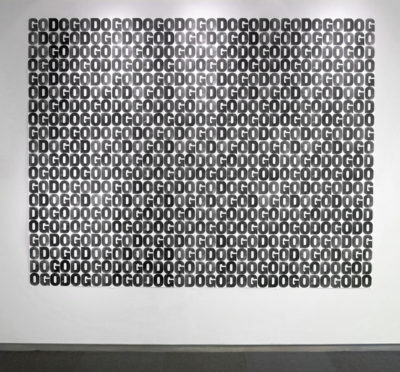 “A 2015 residency at the Center for Book Arts in NY, NY had me reconnecting with my Undergraduate experience in printmaking through their extensive moveable and wood type collection and series of electric Vandercook Presses. With my art practice based primarily in language play and reuse materials, I found great pleasure and challenge working in Letterpress and composing works on salvaged papers recycled from the studio. 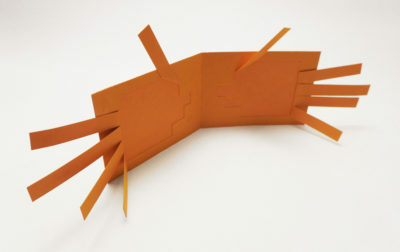 This residency expanded my usual 2-dimensional artmaking into the intimate and handable dimension of small and mini artists books and broadsides. I moved to Cincinnati from NYC in June 2016 for a summer ArtWorks project and in September I rode my Schwinn Prelude and makeshift touring kit on the TransAmerica Bike Trail from Cincinnati to Pittsburgh, Kansas to be with my brother in time for the birth of his first child. 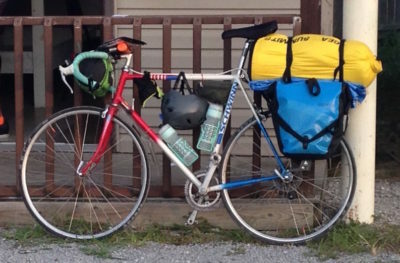 I’d never bike toured before and was able to make the 800-mile trip in 10 days. And it was on day 5, after struggling to reach the summit of yet another rollercoaster hill in the Ozarks, that I decided to ride the entire trail from coast to coast the following spring. Along the way I met so many encouraging and supportive individuals that I wished I had something handmade to give back as a gesture of gratitude, and this is where my residency with Tiger Lily makes this possible for my upcoming trip. I am continuing my pursuit of small letterpress works by producing a collection of artist books and printed matter inspired by my upcoming 3 month cycling trip set for the beginning of May on the TransAmerica Bicycle Trail, a tour spanning 4,230 + miles from Yorktown, Virginia to Astoria, Oregon. Cycling parallels my artistic practice, where endurance, time, space, connection and communication are of equal interest. I see Tiger Lily’s Working Artist Program Residency of time, facilities and supportive community as an exciting opportunity to unify and express these two passions to a wide-ranging audience. 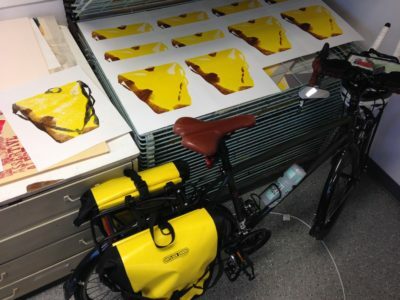 I am spending the first part of my residency at Tiger Lily making work of wordplay and bicycle-oriented subject matter while designing the overall project and printing small works to be gifted to those I meet throughout the tour-fellow cyclists, campers, merchants and overnight hosts. I also hope to make a collection of tire-tread rubbings from the cyclists I meet along the way- there are hundreds on the trail in a given season. 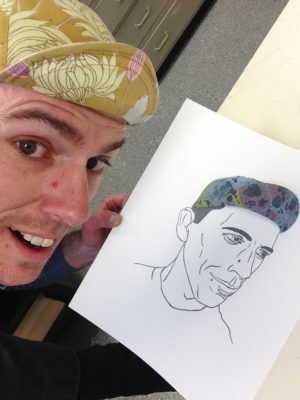 This simple printmaking format will act as a kind of journal or accruing snapshot of the trip and serve as another playful means of connection. Additionally I hope to document these exchanges while note-taking, photographing and possibly blogging the trip- the Instagram account is already live and you can follow me @bradthieleart. The second half of the residency will be spent realizing my experience into a playfully inclusive artist book scroll with accompanying loose printed matter of drawing, collage, letterpress, woodcut and screen printing processes.